The film adaptation is an engaging and affectionate depiction of two ordinary Londoners, Ethel and Ernest, living through extraordinary events and immense social change. Their marriage spans some of the most defining moments of the 20th century. From their first chance encounter in 1929, we see through their eyes the build up to World War 2, the trials of the war years themselves, the joy of VE day, the post war austerity of the1950s, the coming of modern conveniences like the telephone, fridge, and TV, through to men landing on the moon in the 1960s. Their deaths, within months of each other, in 1971, are depicted without sentimentality. Yet it is an emotional blow for the viewer, who has grown to know and love these two very different characters. Both Ethel and Ernest are from working class backgrounds, but whereas Ethel’s greatest fear is to be thought of as “common”, Ernest is proud of his roots and seeks justice for the working man through his socialist ideals. These differences cause much of the comic friction in the film, with Ernest often being left dumbstruck by Ethel’s withering replies. Through a series of domestic vignettes, a vivid sense of life in Britain over four decades is conjured up, interspersed with scenes of strong character-led comedy. Starting in the 1930s, we follow the couple as they decide to get married and Ethel leaves her employment as a Lady’s Maid and Ernest takes up his appointment as a milkman. Ethel who is 5 years older than Ernest longs for a family and at the age of 38 she is overjoyed when she finds that she is pregnant. 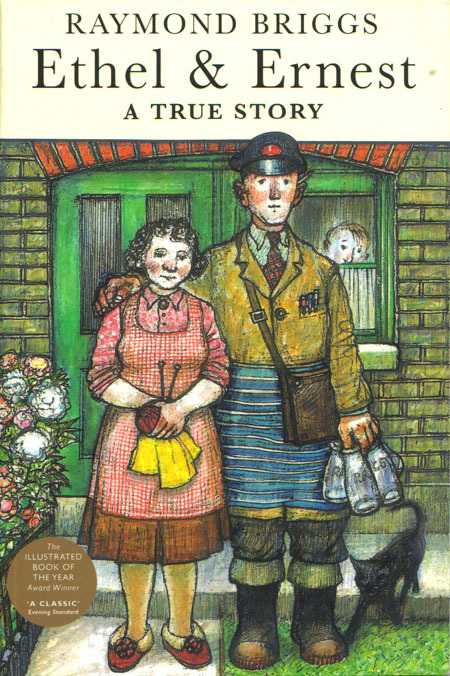 Ethel gives birth to a baby boy, and Raymond Briggs becomes their only and much loved son. The war years show how Raymond had to be evacuated to relatives in Dorset, and how Ernest helps with the war effort as a part time fireman. We see scenes of the London Blitz, hear Winston Churchill’s “Finest Hour” speech, and watch as Raymond and Ernest come under attack from German “doodlebug” bombs. Ration-book Britain finds Ethel and Ernest comically bickering about whose Government, Tory or Labour, is doing the best. Meanwhile young Raymond has earned himself a place in the local grammar school, and this brings out Ethel’s snobbery in exchanges she has with her nosey neighbour Mrs Bennett. When Raymond decides to leave the grammar school early and go to art school both his parents are horrified. The film is enlivened by hit songs from each decade that will spark fond memories for many, while entrancing those hearing them for the first time. But Ethel and Ernest is more than a chance to indulge in nostalgia. Its universal appeal comes from exploring big events through the detail of ordinary people’s lives, and the story of their love will touch the heart of everyone who sees it. ETHEL and ERNEST _ The Movie. Producers: John Coates and Camilla Deakin. This is such a moving story and the film is going to be wonderful too. Can’t wait to get started!